HOMFY California King Premium Hypoallergenic Waterproof Mattress Protector, Deep Pocket Fitted Sheet (18"), Anti-Dust Mite and Soft Breathable (White, California King). Soft & breathable toweling surface with 100% waterproof TPU. 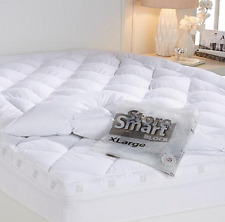 Sleep soundly and worry-free with this PureCare StainGuard waterproof mattress protector. Waterproof yet breathable. King: 72" x 84". Polyester, cotton. Machine wash. See pictures of exact item for sale. With this SuperLoft fiberbed, give yourself indulgent nights on a soft, fluffy mattress with stain protection for peace of mind. More fill than basic SuperLoft. 4" of total loft from base to top. of fill per square yard for enhanced comfort and support. Pillowtop Mattress Pad Cover California King Size Hypoallergenic Cotton Down Alternative Filled Mattress Topper. ★DEEP POCKET & MACHINE WASHABLE: CAL KING 72"x84". 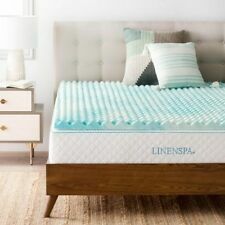 The mattress pad is machine washable for easy maintenance and durable, extending the life of your mattress. Up for your consideration, is this brand new in its factory sealed package safe rest premium mattress protector in California king size. 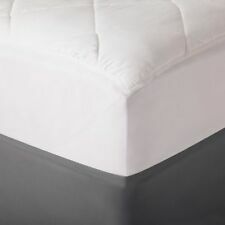 This mattress protector protects against fluids, dust mite, and bacteria. This item will be mailed to you within 24 hours of receiving your payment from my smoke-free home and will include tracking in addition to the free shipping. At this time I do not ship internationally, nor will I accept returns on this safety sealed items so please make your purchase carefully. Thank you for looking at my item and have a great day.